It would appear as though Man Utd boss Jose Mourinho enjoyed what he saw from England duo Luke Shaw and Marcus Rashford on Saturday night. The pair were in action for Gareth Southgate’s side as they kicked off their UEFA Nations League campaign by hosting Spain at Wembley. Although the visitors eventually ran out 2-1 winners, there was real quality involved as England broke the deadlock. As seen in the video below, Shaw played a superb pass through to put Rashford in behind the Spain defence and the forward kept his composure to slot his effort into the back of the net. It was a great bit of play from both players as they continue to try and establish themselves as regulars for club and country, and based on the images below, it appears as though Mourinho was certainly impressed with what he saw. Several Twitter users purport that the reaction below came immediately after Rashford’s goal, and although it’s just short of a smile, it undoubtedly looks like a genuine acknowledgement of being impressed with that sequence of play. 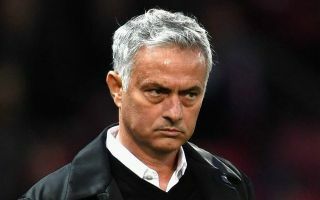 With Shaw picking up a head injury in the second half which forced him off on a stretcher, Mourinho’s mood perhaps soured as the game went on and so now he’ll be hoping that his left-back can make a speedy recovery having been an ever-present thus far this season.